The Road to NM 2016 #5 – Battle report! 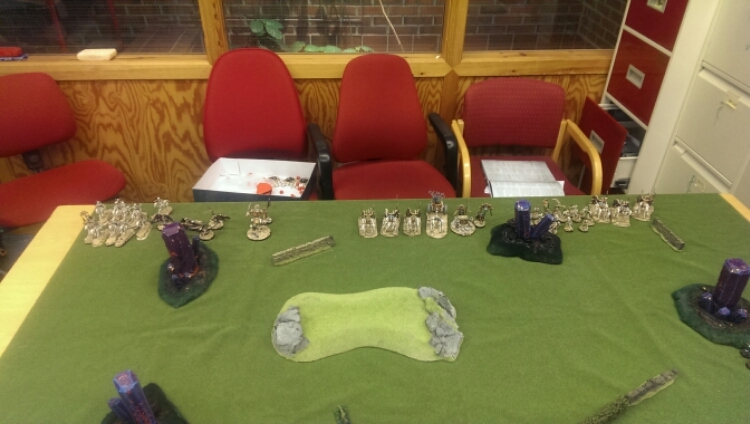 First round of playtesting of my list for the nationals against Dark Elves! Comp and my list can be found here. We played a simplified version as this was my opponent, Rune’s first AoS game. Basically we just used the points system and measuring from the bases while leaving objectives out of it. This was perfectly fine by me as I just wanted to get a feel for my new army on the table top. Rune got first turn and just advanced very aggressively towards me. Especially his Dark riders up in the center. He let loose but only killed a couple of skeleton archers. 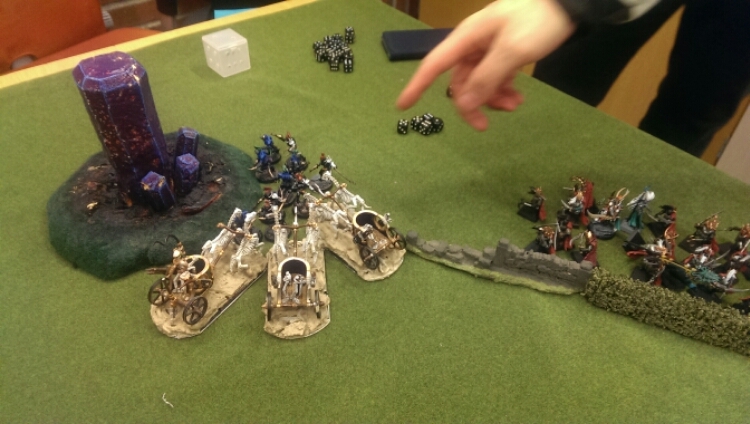 In my turn used my command skill to reroll the charge range on chariots and chipped a couple of wounds off the dark riders with the Casket. My icon in the skeleton unit regenerated the casualties. 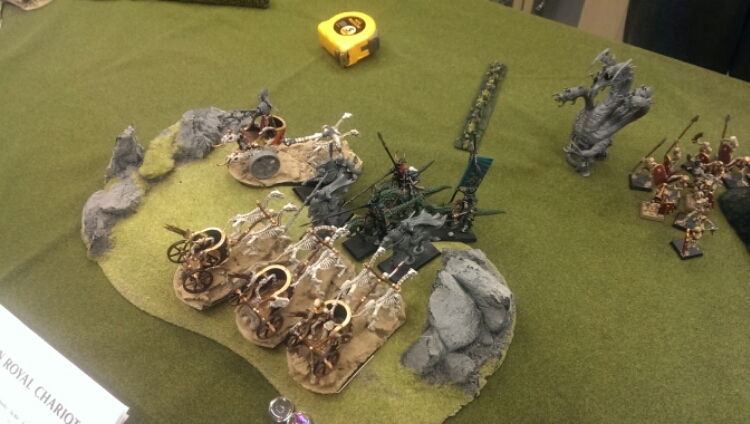 I then set up all my chariots for charging and the carrion + horse archers start a flank move. My shooting was largely ineffective but I have lots of shots though. Can’t remember the battleshock phase but one thing is certain. You really need to hurt to bad to get an effect on them in this phase with a bravery of 10. Rune start again and now he’s got the Kharybdiss in reach. His shooting is very effective and puts a proper hurting on my chariots. Luckily my units aren’t removed so I can get to use my icons. 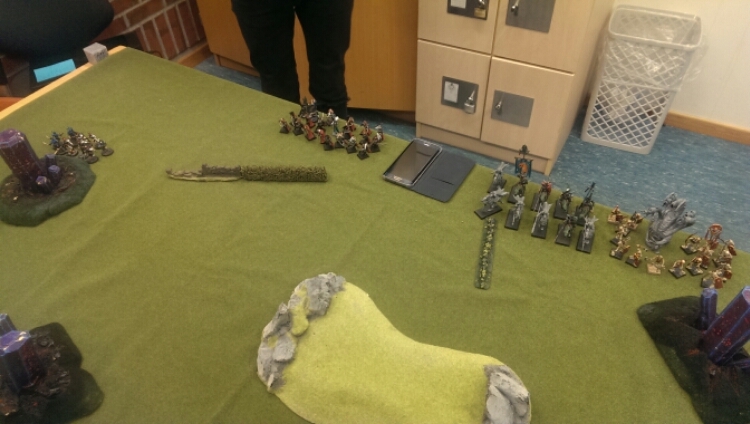 He charge with the big monster against my general and his corsairs charge my leftmost flank unit of chariots. In combat the corsairs almost killed my entire chariot unit but I think I got off with 1-2 wounds left on the last one. I removed my casualties in such a way that his dreadlord couldn’t reach me so that really saved the day. In the other combat we trade blows and he flunks a bit with his kharybdiss against my general and in retaliation I shaved quite a few wounds off it. Battleshock phase is vague but it didn’t do much in our game. In my turn I used the Casket to inflict a lucky 3 mortal wounds on his general. I set down the heralds icon and regenerated the leftmost chariots to full strength. I then managed in my eagerness to forget both my move and shooting phase – DOH! I won’t do that mistake again.. Okay so over to combat..
My chariots in both combats prove ineffective. Their shooting is undoubtedly their strongest card. That and the horses. They’re badass. No really! Otherwise it was a stalemate as we chipped wounds off each other but nothing big happened. Rune keeps the initiative over me and he piled in with everything he had equally divided between the two combats. His shooting is quite dangerous because it such a high volume and he really managed to hurt me there. In the leftmost combat I once again survive by the skin of my teeth. It’s basically clever removal of my losses to minimize how many units of his (to avoid the dreadlord honestly). 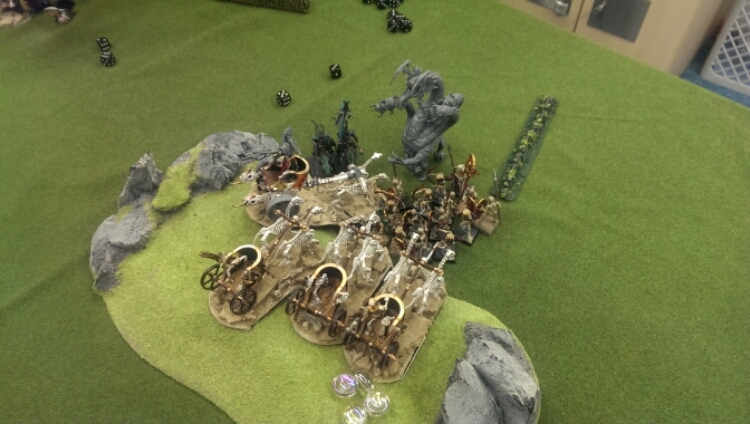 In the other combat the kharybdiss survive with one wound left and the skeletons are halved. I remember to move..carrions to reinforce the center combat and the horse archers to be able to support by fire the same combat. In the shooting phase I now remember to fire. Yay me right 😉 I chipped away some wounds here and there but the horse archers managed to take down the kharybdiss. Big score! In combat my leftmost chariots took out the shades and in the center I cleared away the remaining dark riders and skeletons. If we disregard that Rune is a rookie AoS players let’s instead take a look on what I did and how my units performed. Remember my goal was to get a feel for my army as I had no idea on how it would work. I’ll break it down into a unit by unit review as my tactics in-game was lacking beside a few highlights in my combat and hero phase. What a beast! He’s basically a tank and his buff is really important to get the normal chariots to work. I love this dude! This one is an auto-include due to his standard of undying legion. It’s sad I don’t have a horse for him but I’ll manage I hope. Though this will be one up for review. This one is just fantastic! It’s basically a sniper of high value targets. One thing that can improve it is adding a liche priest and I really want to but I can’t see what to cut to include it. Not much to say really but they do more good as archers rather than just a combat oriented unit. I think they’re good to have as they give me some much needed quantity. I can really appreciate their potential as a harassment unit I just need to learn to use them as exactly that and utilise their abilities properly. They have a terrific output. These are definitely a bit hit or miss but combined with the generals command ability they hit quite hard actually. The best part though is that with clever positioning combined with their large bases you can really steer the combat your way and minimize your own losses. For me these where much more reliable and sustainable in a tarpit than I thought. Happy so far! Well it’s my fault but I have per now no idea on how he performs! Wow these where actually a big surprise! Loads of attacks hits on 4+ and wounds on 3+ is definitely some of the more potent I have. This combined with their maneuverability makes them an essential tool for me. Same as the bone giant. Moving on! The majority of the list works great but I still have a lot of ironing out to do and I need to get to grips with the horse archers, necrotect & bone giant.